Another day, another London-themed map-related projected. Curiocity is a rather lovely tiny ‘mapazine’, that combines a magazine with a map and folds up into a cute – and curious – little package that costs just £2. 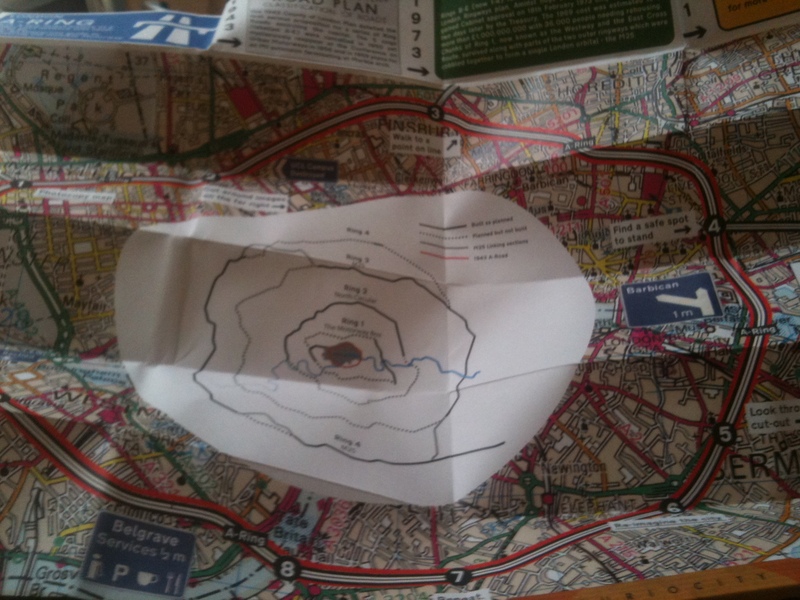 One side features a stack of London-related trivia, including a loosely-mapped Charlie Chaplin walk around Lambeth, a ley-lines walk from Parliament Hill to Tower Hill and a ‘route’ from Hampstead tube to the mixed bathing ponds written out ransom note-style and snaking over five columns. 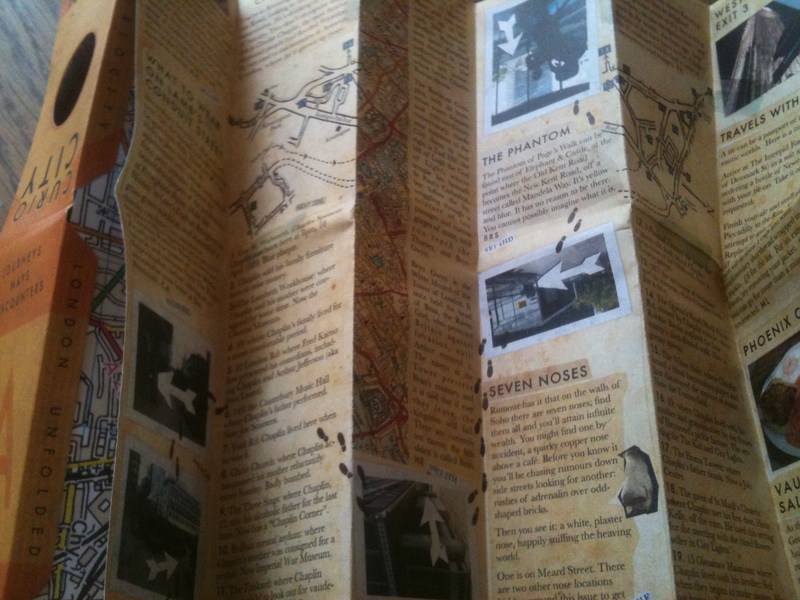 There’s loads more, including bits on the Seven Noses of Soho and a game involving pigeons. It’s witty and it’s whimsical, both of which are obviously very good things indeed. On the reverse is an entirely unusable but rather interesting map showing the history of London’s orbital road networks, a fascinating story which can be studied in detail here or in even more detail here. Curiocity is available in a few choice London locations, including Stanfords, the London Review of Books Bookshop, the ICA and the Wellcome. It also has a website and is a more than welcome addition to the London publications landscape. I interviewed Tony Adams in May for BMI’s Voyager magazine, and we talked at length about Arsène Wenger, who is currently under all sorts of pressure at Arsenal. Adams clearly holds Wenger in great esteem and affection, but seems to feel the pre-history of Arsenal – the terrific team put together by George Graham – has been unfairly forgotten. His comments are an attempt to place Wenger’s achievements in perspective and to understand that his success was only a continuation of what was started by Graham. Wenger is often credited with ending the drinking culture at Arsenal, but Adams says he’d already given up booze at this point and that was something else Wenger benefited from. This terrific interview in The Sunday Times about Graham and Wenger with Adams, Steve Bould, Nigel Winterburn and Lee Dixon seems to back up what Adams told me. It’s an interesting argument. The counter-argument is this goal, although in light of Adams’s comments it no longer looks quite so remarkable – just a triumphant and fit centre-half with a three-goal cushion running through a knackered, battered defence at the end of the season and belting the ball unscientifically past a beleaguered keeper. Total football, or just taking the piss? The growth of online mapping – as seen by the excellent London Mapping website, which collects some of the best digital maps around – has not meant the end of paper maps. I’ve mentioned Herb Lester‘s lovely themed maps before with reference to their 1960s map of London’s West End, Wish You Were There, and they continue to add new maps to their range, branching into different cities and themes while maintaining an impeccable eye for design. Untamed London, for nature-lovers, is their latest offering. 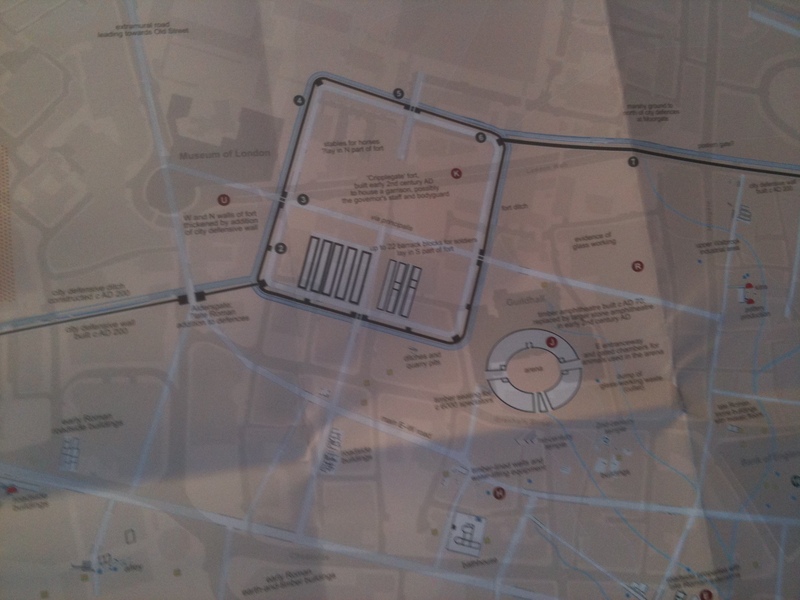 I’ve also finally got my hands on the Museum of London’s Londonium map and it is hugely impressive. This has been produced by MOLAS, the Museum of London Archeological Service, and is a huge map of the City, with the Roman topography superimposed over a plan of the contemporary city – a little like a paper version of the technology used for the Time Travel Explorer app. Key Roman finds are listed, with an explanation of what they are and how they can be accessed, while the reverse side has a potted history of Roman London, with many illustrations. 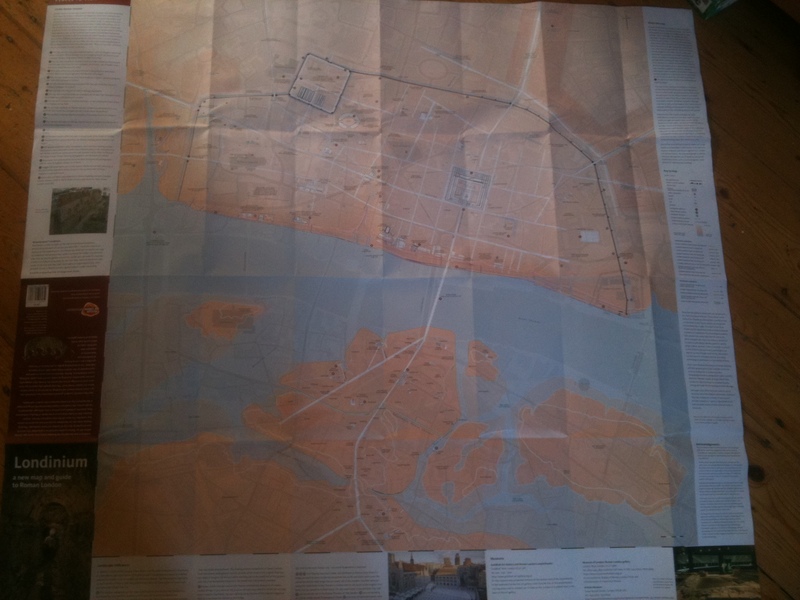 The map is printed on good thick paper so won’t tear easily (a constant problem for frequently folded paper maps), and works beautifully as both a decorative item and a practical plan for hunting down the existing remains of Londonium. It costs just £6.25 and should it prove to be a big seller – which I imagine it will – I hope the Museum can persuade their friends at MOLA to produce more maps along the same lines. One for the Olympic Park at around this time next year, perhaps? Like many adolescent boys who thought they were cleverer than they really were and were scared of girls, I was obsessed with The Smiths and Morrissey. The Smiths are a Manchester band, but by the time I became a fan, Morrissey had – like so many Northerners – fled the provinces for London where he spent the next few years revelling in the size, confusion and culture of the Big Smoke. Instead of Whalley Range and the Moors Murders, he sang about Earl’s Court and the Krays and as he entered his ‘Glam Nazi’ era he became obsessed with distinctly London aspects of working-class life such as skinheads, West Ham and the Cockney Rejects. This was Morrissey’s London period; you could argue it began with the Smiths songs London (1987) and Half A Person (1987), and lasted until he was hounded out of the capital for going a bit crap around a decade later. Sure, London still cropped up in later songs – 2004’s Come Back To Camden, for instance – but the love was gone. He would later sound like any other tedious expat whn complaining to the NME that ‘if you walk through Knightsbridge on any bland day of the week you won’t hear an English accent. You’ll hear every accent under the sun apart from the British accent.’ But it was fun while it lasted. Although Morrissey’s previous solo singles were very London-influenced, this was the first – rather odd – video to be clearly filmed in London. But where? The red bus glimpsed at 1:21 may tell somebody with better eyesight than I. Is it a 34, placing this somewhere between Barnet and Walthamstow? Update: Comments suggest this is Battersea, so not the 34 after all. Maybe the 37? A pretty poor song, but the video marks the start of Morrissey’s skinhead obsession – it was not long after this that he took to performing before a skinhead backdrop and brandishing the Union Jack at Finsbury Park. There are lots of buses here, and also a gorgeous ghost sign at 1:47. But where is it shot? Charing Cross Road? The City? Victoria? Anybody? Update: Comments place this definitively as King’s Cross. I hated this when it came out, but I was wrong because it is brilliant and the video is a treat as Morrissey wanders around a still not-quite-gentrified Wapping with the gang of bequiffed young boys who have put a smile back on his own thin and youthful face. Most Morrissey fans get a kick out of seeing the old boy looking happy, which is why his recent ‘love’ album, Ringleader Of The Tormentors, got such strangely good reviews. 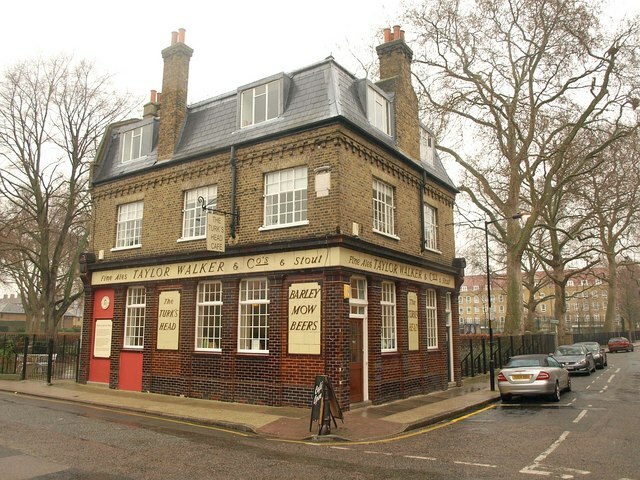 The abandoned pub in this video is now the Turk’s Head cafe and you can also catch a glimpse of Oliver’s Wharf, which was one of the first warehouses in the area to be redeveloped into housing. An awful song, but an unmistakable setting as a young skin takes ‘fatty’ on a date, while Moz whines about how ‘all over Battersea’ there’s ‘some hope, and some despair’, over a shot of the power station. Interestingly, a scene from one of Morrissey’s favourite Northern kitchen sink dramas, ‘Saturday Night and Sunday Morning’ was filmed by director Karel Reisz around here, in Culvert Road, Battersea. Of Reisz, we’ll hear more later. From the start of Morrissey’s decline – and height of his obsession-with-male-physicality – this ho-hum single was filmed at the legendary York Hall, Bethnal Green, as can be seen in the rather elegant closing shots. Such a terrible song I didn’t know anything about it until now, as I had long lost interest in Morrissey at this point, but it’s filmed in Victoria Park in East London. And the cover featured this iconic Morrissey shot, outside old Kray haunt the Grave Maurice (now, I think a fried chicken shop). There were many other London influences in Morrissey’s songs at the time, with the Kray-referencing Last Of The Famous International Playboys, the song Spring-Heeled Jim (a reference to the Victorian London monster Spring-Heeled Jack), the song titles Piccadilly Palare and Dagenham Dave, and the album titles Your Arsenal and Vauxhall & I, as Morrissey explored the seamy side of London life. He was also rumoured to be making his first acting appearance at around this time as the South London gangster Charlie Richardson, although sadly that never came to pass. I’ll leave you with one last example. This clip is of Kennington kids discussing the infamous case of Derek Bentley, who was sentenced to death for his part in the shooting of a policeman in Croydon, and it comes from Karel Reisz’s classic London documentary ‘We Are The Lambeth Boys’. It was sampled by Morrissey for the track Spring-Heeled Jim, which featured on the Vauxhall & I album. How much more London can you get? Was this Tottenham last Saturday? Brixton on Sunday? Battersea or Croydon on Monday? Manchester on Tuesday? Surely it must be from one of those occasions this week when England was forced to confront the reality of a ‘sub-educated, feral underclass’ in a post-Thatcher ‘something-for-nothing society’ (as Andrew Roberts so colourfully described it). Well, actually no. This was way back in 1983, in tiny Luxembourg, where England fans went on a smashing and looting spree after failing to qualify for the European Championships. Football hooliganism was approaching its nadir after a 20 year spiral that had almost destroyed the national sport and left the authorities baffled at how to control it. Mob looting by football supporters dates back to at least 1976, when Liverpool supporters descended in large groups to rob shops in St Etienne, where they were watching a European Cup tie. It soon became assimilated into the away trip – usually while being escorted back to the station, away supporters would smash up city centres, fight the police and, if the opportunity arose, loot goods from shops: a jeweller here, a clothes shop there. Whatever could be easily lifted and carried back home. The past week’s violence certainly seemed unprecedented – and in some ways it was – but there are significant parallels with the way overwhelmingly young football fans routinely behaved in the 1970s and 1980s. There’s the casual disregard for other people’s property, the mania of the crowd, the opportunist thieving and violence, the loose organisation into gangs, the sheer thrill of anarchy, the speed of movement and the power of being able to catch the police wrong-footed. The fear is that mass lootings will become a commonplace event, another part of our lives, as criminal gangs realise what they can get away with if there are enough of them around and as long as the law and lawmakers remain clueless at how to respond. It certainly took the authorities a long time to get a handle on how to police football, but the experience has now been completely transformed, partly because of tough sentences for hooligans, partly because of the disasters at Heysel and Hillsborough but also because the football establishment itself realised it had to change the way it regarded football supporters if the behaviour of fans was to improve. When I watched a small group of 20 or 30 kids terrorise Hackney in broad daylight on Monday afternoon while the police stood and watched, my first instinct was that they would never have let a bunch of football supporters behave like that these days. There are always lessons to be learnt from the past, if you look in the right places. 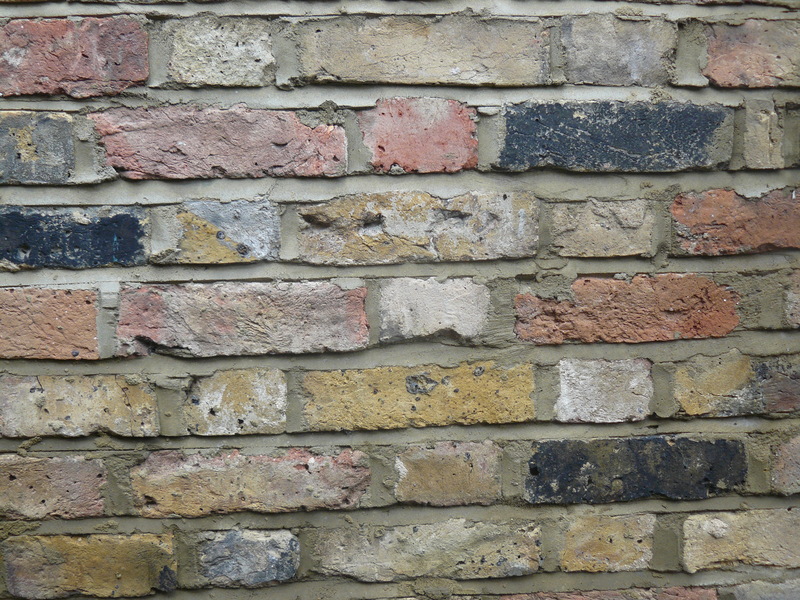 ‘The bricks – laid Flemish bond, headers and stretchers alternating – were all old London stock bricks, but of many kinds and colours: rust red, beige, grey, brown, nearly black. Here and there were yellow ones – malm bricks made with an admixture of clay and chalk. The cumulative effect was pleasing – the variety gave texture, interest and warmth to the surface of the wall. The eye approved the range of colour, the uneven look, the way in which each brick differed from its neighbour and yet was in subtle harmony. But, more that that, to look at it was to see the way in which this wall arose from the ashes of many buildings. Studying it, Matthew saw in his mind’s eye warehouses and churches, factories and shops, terrace houses like this one, blasted to the ground perhaps on some furnace night of 1940. He thought of how the city lifts again and again from its own decay, thrusting up from its own detritus, from the sediment of brick dust, rubble, wood splinters, rusted iron, potsherds, coins and bones. He thought of himself, living briefly on top of this pile, inheriting its physical variety and, above all, the clamour of its references. The thought sustained him, in some curious way, as he sat at his desk in the flat which was not yet a home, or as he moved through days and through the city, from Finsbury to Docklands to Covent Garden to Lincoln’s Inn. 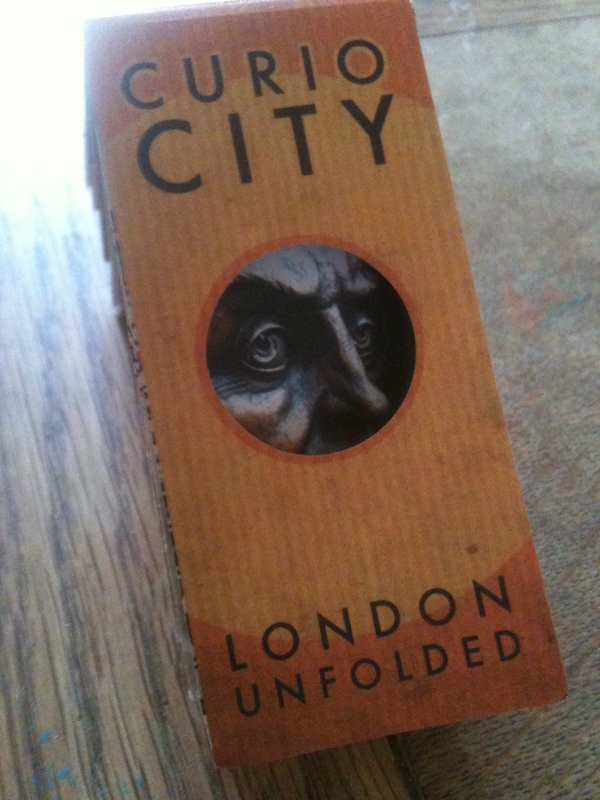 Penelope Lively in ‘City Of The Mind’ (1991, Andre Deutsch).